Micro BL-portable headphone AMP,Preamp and DAC! 耳机大家坛»论坛 › 行业品牌专区 › iFi › Micro BL - portable headphone AMP, Preamp and DAC! When Hi-Fi+ reviewed iFi Audio’s original Micro iDSD headphone amp, preamp, and DAC back in 2014 we said it was “possessed of more clever, creative, and forward-looking features than just about any other product of its size, type, or price.” That’s still true today, but now the Micro iDSD has evolved into a significantly improved new Micro iDSD Black Label Edition (￡549/$549), which sports uprated parts on the inside and a distinctive satin-finished, “none more black” chassis exterior. Like its predecessor, the Black Label seems the very definition of what a ‘do-it-all’ product should be, which means reviewers face the daunting task of describing the device’s many features, functions, and capabilities within the tight confines of a print review. I’ll do my best, but please bear in mind I’ve got a lot of ground to cover. The Micro iDSD Black Label features revised versions of the firm’s signature 3D and XBass functions—now called the 3D+ and XBass+ circuits. 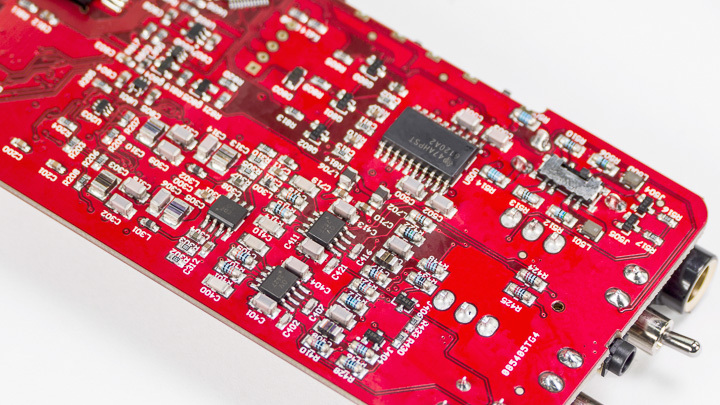 The 3D+ function provides two separate circuits, one optimized for headphones and the other for loudspeakers; there is context sensitive auto-switching to invoke the appropriate circuit depending on whether the Black Label is being used as a headphone amp or as a preamp/DAC. The XBass+ function in turn provides a judicious touch of bass enhancement that gives more deeply extended and also tighter bass response. Having worked with iFi’s earlier iterations of the 3D and XBass circuits, I can confirm that the 3D+ and XBass+ versions are audibly subtler and more refined than their predecessors, meaning they have become features even finicky audiophiles might now wish to use. The Black Label sports an intelligent combination optical/coaxial S/PDIF input/output jack (rear panel), a USB 2.0 ‘OTG’ port (also on the rear panel), and 3.5mm stereo analogue input (front panel). 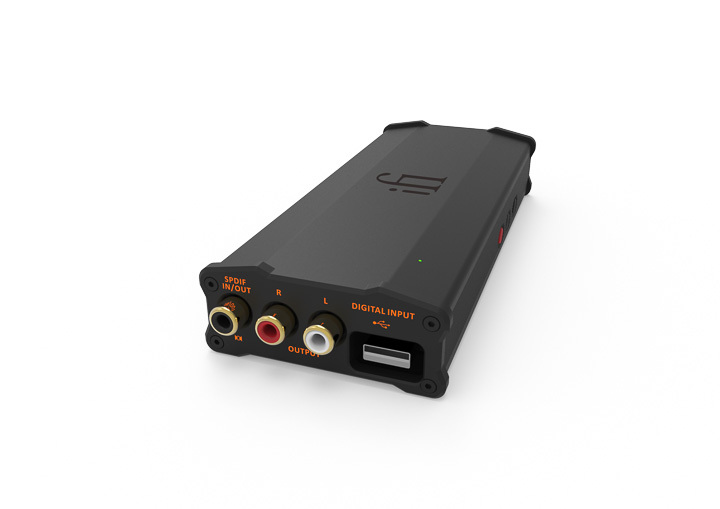 It also offers the aforementioned combo S/PDIF coaxial/optical input/output jack, set of stereo analogue output via RCA jack (rear panel), and a 6.35mm headphone output jack (front panel). As a convenience touch, the Black Label provides a side-mounted USB fast charging port (1.2–5V @ 1.5A) for topping off the charge on smartphones, etc. The Black Label’s user controls are simple and elegant, comprising on/off toggle switches for the aforementioned 3D+ and XBass+ circuits plus a rotary on/off switch and precision analogue volume control (both found on the front panel). Finally, there is a small, top-mounted, multi-function/multi-colour pilot light that indicates battery charge status when the unit is hooked up to a USB charger, but that indicates digital audio formats and resolution levels when the Black Label plays music from digital sources. To put the Micro iDSD Black Label through its paces in my listening tests, I connected it to a Windows/jRiver Media Center-based music server loaded with a mix of standard and high-res PCM, DXD, and DSD files. To test the amp’s versatility, I used it with three sets of transducers: the very low-sensitivity HiFiMAN Susvara planar magnetic headphones, the moderately sensitive MrSpeakers ETHER Flow planar magnetic headphones, and the extremely sensitive JH Audio Lola custom-fit in-ear monitors. From the outset, the Black Label offered the smooth, engaging, and highly musical presentation we’ve come to expect from iFi and AMR components, but with a significant twist. Specifically, the Black Label offered audibly enhanced transient speed, definition, clarity, and resolution vis-à-vis the iFi models that preceded it. As a result the Black Label breaks with past iFi tradition in a good way, offering a sound that finds the just-right balance point between natural warmth and inviting musicality on the one hand, coupled with dramatic levels of focus, detail, and transient agility on the other. Musically speaking, this combination of sonic virtues is simply intoxicating. Let me cite two tracks that showed the level of performance of which the Micro iDSD Black Label is capable. The first is ‘No Apology’ from composer/guitarist Janet Feder’s album THIS CLOSE [Blue Coast, DSD64], primarily featuring Feder’s guitar accompanied by simple percussion, and captured in a rich, reverberant space. On all my test headphones, but especially the HiFiMAN Susvara, the Black Label unlocked the intricate transient sounds and rich harmonics of Feder’s guitar along with the dry, soulful ‘skin sounds’ of the percussion accompaniment, both presented with the oh-so-rare combination of crystalline clarity and natural organic warmth. Moreover, the recording conveyed an uncanny sense of space while neatly overcoming the tendency headphones sometimes have of trapping the sound ‘inside the listener’s head’. Best of all, the Black Label’s Power Mode and iEMatch switches let me tune the amp’s output to take full advantage of all three of my test transducers. Next let me reference the track ‘Celestial Echo’ from Malia and Boris Blank’s album Convergence [Verve, 16/44.1], which highlights Malia’s airy and breathy-sounding vocals as set against the almost brooding backdrop of atmospheric synth passages interspersed with periodic very low frequency bass passages. What struck me was the Black Label’s ability to ‘float’ Malia’s voice in the open air, while at same time delivering the sometimes very sharp attack of synth notes plus the deep-plunging low bass comments, which were supplied with terrific pitch definition and satisfying weight and gravitas. Candidly, I have heard this track played through full-size desktop headphone amp/DAC with four-figure price tags, and I can say with absolute confidence that the portable Micros iDSD Black Label can and does stand tall in their company, which is pretty remarkable.